CELEBRATING OVER 50 YEARS IN BUSINESS! Tom’s Auto Body, Inc. is a full-service automotive collision repair company. Since 1966, we’ve provided the finest quality service. We have an “A+” rating with the Better Business Bureau. We offer a lifetime warranty on all labor, parts, and paint. We specialize in great customer service. Our hours are Monday-Friday 8am-5pm. At Tom’s Auto Body, Inc. we believe in high quality repairs, excellent customer service, and a commitment to honesty, safety, and integrity. Choosing the right shop for your needs is important. Please visit our convenient location and see for yourself why our customers are satisfied. We hope to be your choice for years to come. Hood Repair exceeded our expectations! It was quick, affordable and the paint job is flawless. Fantastic honest shop. Staff professional and friendly. Have taken several family vehicles to Tom’s for work and has always been super satisfied. Prices are more than fair. Tom’s Auto Body is the best! The work they did on my Mustang was amazing! It looks great and they didn’t charge me a fortune. Everyone was very helpful and professional. They got the repair done on time and under budget with excellent results. I will never take my car anywhere else. Like I said, Tom’s Auto Body is the best!!! Highly recommend! Chris and crew did an excellent job repairing my Camaro, including giving special attention to the modifications I installed previously, very accommodating! Thanks Art!! Job well done! This is the second time I use Tom’s. They do a great job and are very friendly.I would have no problems recommending them to a friend. Easy in, easy out….awesome job!!! I would totally use them again! Very friendly and professional. They did a great job and made the truck look like new. We will recommend. As always, GREAT, fast efficient service! I dropped off my car and my rental was ready. I received updates throughout the process and am very pleased with the repairs. Quality work every time! Great experience! Very professional and friendly as well as doing a fantastic job fixing my car. If I need a body shop again I will definitely go to Tom’s. Satisfied with the work. Efficient and helpful, all done in a timely manner. I would recommend to others. I felt they were honest and their charges for the work were reasonable. Best service ever! My car looks like new, inside and out, thanks to the expert services of Ron, Art and Tom. I would recommend Tom’s Auto Body to anyone looking for excellent body work and great customer service in a friendly environment. It was the best experience I could have possibly had after being rear-ended and forced to deal with the “accident aftermath” process. Thank you Tom’s Auto Body! Very satisfied! Art and the rest of the team did an amazing job on communicating back and fourth as my car was in the shop. My car came back better than ever! Definitely recommend this place to anyone! Words can’t how happy I am with the end result. Tom’s auto body was excellent! They were so helpful and did a great job! My car looks like new. I would highly recommend Tom’s auto body for repair. Ron and art always do a great job and the work is impeccable. With all of my kids fender benders, Ron and Art have become friends of the family with all the body work my fleet has required over the years. They are professional, fair and provide great quality work. I would highly recommend them to anyone needing body work repairs. They will also pick you up or drop you off at Sky Harbor if that fits into your plans. something wrong with my driving side door, cant open or lock smoothly. so i went to TOM’S AUTO SHOP, setup by Dad Tom in the year of 1966. but operated by two sons. i feel i have got a friendly, efficient service at this shop . very good employees as well as good boss, Good service you will experience if you go there! Had a great experience. Ron was helpful and knowlegdable and made me feel like my business was important. The repair went smoothly and I am 100% satisfied with the repair. I was recommended to Tom’s Auto Body by a co-worker, and I’m so glad I took his advise. My car looks likes new and was ready when they said it would be. Art was a pleasure to work with. These folks are the best! I would highly recommend them and I would use them again in a heartbeat. Art did a “bang-up” job from start to finish. He greeted me with humor and expertise. What sets the shop apart is each and every member of the team greets you as if you matter. They answer questions only once they are sure of the answers, yet never hesitate to tell you the truth. It took a little longer, because more work needed to be done than originally projected. They called me without prompting. They showed that they care about the safety and quality of their work. Ultimately, they presented my car as good as new, with not a dent or a crease or other tell-tale mark or blemish. The shop is first-rate and I recommend them without any hesitation! Ron and Art are the real deal. I’ve known them for over 30 years. Met them when I worked for a local tv station. They handled all of their news units and did great work. So when it comes time to work on my personal vehicle. There is no other shop out there I trust more. These guys have a clean operation and their people are all about customer service and satisfaction. I give them 5 cars easy! Superior company! The estimate for the time to repair was spot on. The work performed was to our satisfaction as well. The best part was their professional communication before, during and after the process. I will refer them to anyone. Art and Ron are the only ones who I would trust my family’s and friend’s auto body work to. We have been using them since the early 1980’s and have never disappointed me. They are a preferred shop for many insurance companies and even have contracts with the City of Phoenix and other municipalities. And whenever I want repairs done outside of insurance claims, Tom’s always provides me with great work and reasonable prices. They never do unnecessary work and will, if asked, find the best value in auto body parts available unless I ask only for OEM parts. I trust Art and Ron to professionally handle all my family’s collision work. And my employees at work have always been happy I referred them to Tom’s. If you don’t have a long-term relationship with a particular shop or have not been happy with service and prices in the shops you have used, call my friends at Tom’s. You won’t be sorry! My experience with Art and Ron was exceptional. They are very professional and go the extra mile. I will definitely refer my friends in need to Tom’s. Awesome place they did a great job with fixing my car! Will definitely come here again! Fast and simple plus they are friendly! They keep it K.I.S.S (keep it stupid simple). Great shop to deal with. Staff defined the process of dealing with another insuree. No hassles from beginning to end. Extremely pleased with the work performed. Best body shop in town! Very professional and they got my truck fixed in a very timely manner. They made the process super easy and my truck looks amazing! Thank you Art, Ron and Tom! Tom’s is the best! Art and Ron are a pleasure to deal with. The door that I had repaired looks as good as new. I had a great experience. I have worked with Art and Ron with Tom’s Auto Body for many years. I have had a couple of personal auto damage repairs and we also use them Company-Wide for all our business repairs. They are superior in every way and very professional! They are always timely on the agreed completion time of my repairs and charge a fair and reasonable price. My insurance company has absolutely no issues with them – all paperwork is completed without any questions or hassle. I RECOMMEND THEM HIGHLY FOR REPAIR WORK NEEDED WITH NO ISSUES WITH A FABULOUS AUTO BODY SHOP!!!! My only regret about Tom’s Auto Body is that I didn’t learn about them (or garagefly.com!) sooner! Approximately 6 months ago I purchased a brand new 2015 Honda Odyssey. Two weeks after I purchased it, I accidentally put a large scratch on the driver’s side passenger door when it slid back and got caught on a metal piece of the cat carrier I was holding. It went though the clear coat finish so buffing it out wasn’t an option. It was awful and I hated having to look at it every time I got in my van so I went about getting an estimate to repair/repaint it. I first received an estimate from Camelback Collision Center and was told $1,200 because they would have to paint the entire side of the van and couldn’t paint just the damaged door. Well, I didn’t get another estimate right away. In fact, it was just a few weeks ago that I discovered garagefly.com and found out about Tom’s. The location was perfect as it was just a few miles from where I work downtown so I was able to go over on my lunch hour to get the estimate. Easy to find and as soon as I walked in, the staff person, Art Ocano, greeted me and was very nice. He took a look at my door and about 5 minutes later, handed me an estimate. I was of course hoping for something less than the $1,200 quote I originally received, but was expecting it to still be around $800. Well, I about fell over when Art told me $436.65 and that painting the entire side of that van wasn’t necessary! I was ready to leave it right then but he said since it might take 3 days, it would be better to drop it off the following Monday so I wouldn’t have to leave it over the weekend. I did exactly that, and also arranged a rental car with Enterprise down the street. They even gave me a discount since I was doing business with Tom’s. At around 4 p.m. on Wednesday, I got a call saying that my van was ready, a whole day earlier than I was expecting! I picked it up about 30 minutes later and was thrilled to see a perfect looking door again that was perfectly matched to the existing paint on the rest of the van! It looked wonderful and once again, the staff was super nice and friendly. I am thrilled that my van once again looks brand new! Thanks Tom’s!! I will definitely give Tom’s my business if the need ever arises again! We brought our Honda CR-V to Tom’s Auto Body on a recommendation from a friend. At first time meeting with Ron, he made the entire process seamless and comfortable, while letting us know exactly what they would be doing and how long it would take. Our situation had to be adjusted some, as we were due to leave out of town. Ron made sure that he would be able to take our vehicle prior to us leaving. The vehicle came back completed as expected and within the time frame that was promised. And by the time the vehicle was picked up (between the 2-3 visits to the shop), the amount of personal conversation between myself and Ron, regarding vehicle repairs, local team sports and high schools, it felt like I have known Ron forever. Can’t ask for better customer service than that…and a vehicle that looked like brand new again to top…. I went to take my vehicle in to this place. I walked in and met Art. I swear it felt like I knew these guys my whole life. I was greeted with great customer care. I was also guaranteed my vehicle would be done correctly as if it was never wrecked. They dealt with the other guys insurance and made sure I was taken care of and not screwed around. Art and Ron are stand up guys and would recommend them to anyone that would need this type of service. Ron helped us during the process and finished up the claim. As far as I am concerned on top notch body shop. These guys are great. Thanks again guys. My experience was perfect. I went in as a result of a slow-speed collision; I was sent there by the other driver’s insurance. I am skeptical right from the bat. I drove down there and met Art. Immediately you could tell that he really does care about your experience. He was positive, engaging, and straight-forward. We went outside, surveyed the damage and within minutes had a quote. I said thank you and departed. The claim was submitted immediately to the insurance company. The initial transaction was smooth and comfortable. I left there already knowing I was going to go back there. So a few days later I made an appointment and dropped off the van. As I dropped off the van he said “MAYBE” Wednesday, but he was leaning toward Thursday. On Wednesday he called and asked if I wanted to pick it up. Since I’d actually planned for a Thursday pick up I had other obligations and couldn’t come. No problem, he said. I was scheduled to come in at 9. At 8:30 am the next morning I called in to the receptionist with a total and that I would be there just after 9. Art called back about 15 minutes with the total. At 9:15 am I rolled up and the van was ready. Oh, and it’d been cleaned up a bit as well. From the moment I met Art to the moment I walked out of the shop the experience was amazing. Art (actually, everyone I spoke with or engaged with) were true service professionals. These guys did a great job with some needed cosmetic body work and at a fair price. Recommend them highly. I’ve been coming to Tom’s Auto since I first got my car in 2007. Unfortunately, my car has been probably a handful of times since then. Everything looks brand new once I get my Honda back. The customer service, attention to detail, and friendliness of this place always makes me happy. Being in an accident isn’t the most ideal situation, but Art at Tom’s auto always makes the process so much easier. He is so sincere when he speaks to you and is always willing to go the extra mile. I recommend Tom’s to everyone! My family and friends. Thanks guys! We had the misfortune to have a fender bender and Tom’s Auto Body was recommended, We met with Ron who assured us our car would be fixed right and in a timely manner, the team there did a fantastic job and we felt like family before we left. We highly recommend Tom’s Auto Body to everyone ! 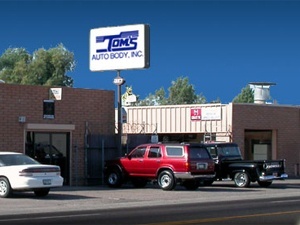 I’d like to give Tom’s Auto Body.1327 E. Buckeye Road in Phoenix, Arizona, a very favorable review. They have straightened three different vehicles for me over the last five or so years. Their work has made the cars look like new, and I always felt that their prices were fair. The work was always completed on time, as promised. Also, they’re all just nice people to deal with. First time using, will use again definitely if accidents occur. Art is both professional and personable! The entire staff is wonderful to work with. From the time I made contact with Tom’s to the time I picked up my car, I was treated like a friend. Everyone wears a smile and seems to enjoy their work. My car was repaired promptly and exquisitely! THANK YOU ART! I am very pleased with their work and I highly recommend them to YOU! My truck got t-boned back in March 2015. I took it to Service King originally who had it for 6 weeks. When I got it back the repairs were incomplete. My trailer hitch wiring harness was hanging from the vehicle, my doors did not close right, they driver door trim panel was broken, and a bunch of other problem. I took it back to Service King a second time and they still did not get everything taken care of. At that point, I contacted my insurance company and told them they needed to find me a new shop because I was refusing to take it back to Service King. They recommended Tom’s. I took it to Tom’s and met with Ron (one of the owner’s) who listened to all of my concerns and told me he would take care of my truck and get it working how it should. They had my truck for a little over a week and a half and when I got it back, not only was it fixed how it should have been the first time, it actually worked like new (because they actually used some “new” parts, not just salvageable parts off my truck that had been hit by an Excursion at 35 mph). I could not be more than pleased and would recommend anyone take their vehicle there. They are not a corporate chain and still understand the concept of family owned and operated. I cannot say enough positive things about Tom’s. The guys at Tom’s were extremely professional and friendly. They did a great job with the body work repair for my truck, and even washed it for me! I couldn’t be happier with the work, and would recommend them highly. Great customer service and professional. Family business for many years. Pleased with work on car. Art and Ron’s guys do a great job, at a reasonable price, on time! what more could anyone ask for. My experience with Art was absolutely smooth and professional. I brought my car in for an estimate and I knew right away that I would not go anyplace else. I live 22 miles away and there are plenty of body shops around where I live but Art made me feel like part of the family and gave me a fair estimate. My car was repaired to new condition and was totally detailed and spotless at no extra charge and delivered on time when promised. Art even offered to give me ride home to drop off the car and pick it up which made it even easier for me. I recommend this Tom’s Auto Body highly. You are dealing with a local family and not the big Corporate that makes you go through numbers before you reach someone. Besides I like to keep my business with an Arizona business. Thanks again Art. This shop does outstanding work. I would “HIGHLY RECOMMEND” this shop. They did an outstanding job at a fair price. In addition, they detailed my vehicle before they gave it back. My vehicle was rear ended as a result there was damage to my bumper. Tom’s Auto Body repaired the damage. They did a beautiful job. The shop was clean and very professional. The office staff extremely helpful and kind. Each person I spoke with was very kind and knowledgeable. I would highly recommend them and go back for business. Great Service and Family friendly, I can’t say enough kind words. They went above and beyond and even stayed up a few minutes late so I could get me car on early. They even offered to pick me up from my job due to my circumstances and recommended a rental car place. Ron who took care of my car is amazingly nice and funny. Art Ocano and the staff at Tom’s Auto Body Shop were awesome. This was the first time in all my driving years such a destructive accident happened to me; they walked me through every step. Art took me to the rent a car center to pick-up a rental and when my car was ready, they picked me up returning me to their shop to receive my repaired car. The repair is perfect no one can ever tell the right side of the car was demolished. You will never meet any nicer gentlemen; no wonder many government agencies contract with them for official vehicle repairs. It’s rare to say that working with an auto body shop is enjoyable, but for this repair, I truly enjoyed working with Art at Tom’s Auto Body. My minivan had a damaged rocker (the part underneath the sliding passenger door). Art gave a good estimate that balanced repairing the rocker while also matching the aesthetics of the vehicle. I called other body shops to see if I was getting a good deal. It turns out the Art was true to his word — his estimate was very competitive with other shops. Upon repairing my vehicle, Art personally gave me a ride back to my house while I waited for the repair. He then drove the car to my house when it was completed. I enjoyed getting to know Art. The body shop was started by his father, and the family business feel of Tom’s is still there today. I highly recommend working with Art or his brother, Ron, at Tom’s. My car was spotless and in perfect condition, until somebody rear-ended me. Tom’s Autobody took complete care of me from start to finish! They work with all insurance companies directly making the process so easy and even have a rental car all set up for you. Speak to either Art or Ron, they are both great!! I mean, what more can you say about a company that has been in PHX for 50 yrs!!! They’re fantastic!!! Quality of work was very very good and the job was completed on the day as promised. I will use this shop again if needed. Terrific customer service. Very professional staff. Art took the time to explain the repairs needed. He also kept me up-to-date on my car’s process. I’d go back to Tom’s Auto Body in a heartbeat. Very friendly staff, and was charged less than expected. Very satisfied. Tom’s Auto Body in Phoenix did a fine job repairing a deep ding in the back end of my RAV 4. I had them do a similar repair 5 or 6 years ago. They are good people to deal with, Ron and Art (brothers, Tom is their father) in the front office. Excellent & timely service, excellent quality, reasonable prices. From the minute I called till the day I picked up my vehicle Art went above and beyond to make the process easy on me. His knowledge and kindness shows why the shop has been in business for as long as they have. The reference was through my insurance company initially but Tom’s Auto Body will be the 1st place I call for any future repair needs. I can’t imagine a better experience with automobile repair as I had with Tom’s auto body shop. From my initial contact with the office assistant, Lisa, to my communication with Ron, it’s been a five-star experience with a five-star business. Did I say that Ron dropped me off at a nearby Light Rail station and picked me up there so I don’t need to pay for a cab ride for drop-off/pick-up? I was moreover so pleased to have learned that this is a very well respected family-owned business! Anyone with a car trouble should just called this place! Very happy with Tom’s, they dealt with the other persons insurance company for me, very quickly. Extremely happy with the repairs with my vehicle. Excellent service. Perfect accommodations were made to get my vehicle back to me in a timely manner. Good people that you can definitely trust. Toms always takes good care of us. We brought our Prius in after an accident and they dealt with the insurance company and returned our car in perfect condition with OE parts. Ron is the best. Very personable and really cares for his customers. We feel like family there. Friendly, caring, helped me with transportation to and from rental car company, to and from work. Work was complete when they promised, the kept me up to date on repairs. They gave me back my car shiny, clean inside and out, and new smelling. We had a minor accident in our carport… One vehicle accidentally backed into the Tacoma. We took it to Tom’s Auto Body and they provided: * Timely estimate * Great customer service * Friendly staff * Spot on promised “fix” date * The vehicle was repaired perfectly and the total car was cleaned inside and out! * Couldn’t be happier with the experience that we had at Tom’s and wouldn’t hesitate to recommend them to anyone! Thank you Ron! This car is my baby and brand new when it was in a fender bender. Toms is the only body shop that I trust to fix my vehicle. They did a great job as always! Their customer service is excellent, and they never let me down! Another vehicle serviced here and we again received the same OUTSTANDING service. They are all super friendly and helpful, the work is done perfectly and quickly. I would recommend this shop to EVERYONE! I’m glad to have found a car repair shop that I can trust. Ron and Art are the best. They helped me with the insurance company and did a great job getting the truck fixed and back on the road all shiny and new again. Excellent bumper work. They even dropped the car off for us after it was complete!! Great quick service. Tom’s did a great job fixing the passenger side doors of my brand new Mazda 6. Since it is a 2014 parts had to be ordered and Ron kept me informed through the whole process. Repairs look great, can hardly tell there was any damage. Thanks guys!! Tom’s did a great job fixing the passenger side doors of my brand new Mazda 6. Since it is a 2014 parts had to be ordered and Ron kept me informed through the whole process. Repairs look great, can hardly tell there was any damage. My car looks better than it ever has!! My son insisted I go to Tom’s and I so so very happy I did. Ron took very good care of me, going above and beyond what I would have expected. Thanks for the great work. I would highly recommend this shop to anyone needed auto body work. great service; quick service. great family owned business. I liked that they have a good rating with BBB and have been in business for over 40 years. I was referred by a good friend and I trust her opinion. They are great to work with and very helpful. It is a family friendly atmosphere and the brothers really connect with their clients. Thank you for everything. Went in to see what was wrong with my bumper & it had been scratched by many over height curbs. Tom’s is great at determining the extent of the damage was just the bumper, ordered a new one and since the car is a 3-stage paint did a perfect match. I would recommend Tom’s to anyone needing body work, paint, etc. Great to do business with. I was a first time customer and won’t go anywhere else again! Great customer service, friendly, great work and very quick! I would recommend to everyone. A great big Thank you to Ron and the crew for an excellent job on my truck. I would highly recommend them to anyone in need of their services! We have been bringing our cars here for years and I can’t imagine trusting our vehicles to anybody else. Ron and Art run an honest, family-owned business that has been serving the Valley forever. Masterful work. The insurer wanted to use some 3rd party parts. Ron and Art explained the 3rd party parts wouldn’t fit exactly right and negotiated coverage for full OEM parts. I’ve been to this shop once before and I’m back because of the prompt, flawless work and the friendly, thoughtful service. Art Ocano, the owner of Tom’s Auto Body, isn’t just a great mechanic, he’s a great person. I came to Tom’s after getting pretty expensive quotes from other top-rated shops on Garage fly. While the price for parts was comparable, the labor at Tom’s was almost $200 less expensive. When I came to pick up my car, the repairs looked incredible and he had even removed a sizable dent from the side panel free of charge! I cannot recommend Tom’s highly enough!! I would highly recommend Tom’s to my friends and family. The took very good care of me and my vehicle. They kept me in the loop as the repairs to my vehicle progressed. They are very professional and easy to work with. If I ever find myself in need of repairs again, I know where I am going. My El Camino came out looking better then ever. they went above of what I expected. Paint matched pefectlly. I will recommend this place to friends and family for sure. My wife takes her car there and so has my daughter and as a family we will continue to do so. They are very friendly people but at the same time they are very profesional. A work colleague referred me to Tom’s Auto Body. My car had damage on the passenger door and side panel. My colleage has used them a few times in the past and reported to me the staff was very knowledgable, professional, friendly and provided courteous. I would like to state I TOTALLY agree with my colleague and would add the staff stayed on schedule and had the car done when they said it would be done! I will refer them and use them “if” I ever need auto body repair again. Tom’s is a very helpful and detailed family business. I would and will recommend to family and friends. They went above what I had expected. It has been over a month now and the van is running and looking great. The extra touches and detailing was great. I was involved in an accident and needed to have some body work done on our van. After doing a search of local body shops I came across Tom’s Auto Body and found out they had been in business since 1966. I called and was pleasantly greeted on the phone. They arranged to have the van towed to shop very quickly. Ron and crew handled everything from dealing with Insurance Company, offering suggestions on a rental service, to actually driving us to rental Car Company where we received a discount for using Tom’s. I hope to never have to use them again but will keep their number handy. The guys at Tom’s Auto Body are amazing. I took my brand new (only 3 weeks old), Mazda 6 in to have the bumper fixed after the garage door scraped my back bumper. I did not feel nervous to leave my brand new car with them as I got a good feeling from my initial phone call to the shop. The work on my car was outstanding and it looks brand new again. Very professional, personable, and honest. I will recommend Tom’s Auto Body to anyone I know needing body work done on their vehicle. I got rear-ended back in November and after chatting with my neighbor decided to take my 2008 Saturn Astra to Tom’s. I couldn’t be happier with the repairs that were performed on the car. They got the car right in and had it all fixed up within a week. Very personable owner’s as well. I had the pleasure to meet the father and the two sons who own and operate the business. Knowledgeable, friendly, and professional. I definitely recommend. This family owned business prides itself in it’s ability to deliver quality service. My jeep had been damaged in the hail storm we had in October of 2010. I was worried that my repairs would be expensive and hard to fix. Art and his crew were very professional and accomidating. They promptly got my jeep back to showroom condition in a short amount of time so I was not out of a veichle for very long. I would highly recomend Tom’s Auto to anyone looking to get great and quality service that’s affordable. I visited Toms for the first time back in August of 2011, my car had been towed here after a minor accident. The staff here was very friendly and honest. The service was outstanding and the communication with Art was like talking to my own brother. These guys are very personable, reasonable and honest folks. I trust this shop because they have the skills and are determined to fix your problem. They really did look out for my best interest! Thank you! I would like to thank Tom’s Body Shop for the great work that they did on my car. Everyone at the shop is very professional and did the job in a timely matter. Tom, Art and Ron have always been very generous with their time and attention. I will always continue to do business with them. 100% thee absolute best treatment i have ever received from ANY repair shop. Down to earth staff Ron & Art are certified badass at what they do. Family owned and operated for over 40 years, it truly feels like your getting the family treatment. Solid work. Wicked turnaround. AND VERY informative. HIGHLY recommended. I have been serviced by Tom’s Auto Body for at least the last 15years. They have done excellent work for me and some of my friends and relatives too! I live in Chandler, but the drive into Phoenix to Tom’s is well worth it! If you want perfection, take your vehicles to Tom’s. You will be more than pleased with their work! The owners (Art and Ron) there at the shop are just awesome! Outstanding body shop. Their repair work on our Saturn was excellent. The paint job blended perfectly with the existing paint and you cannot tell anything ever happened. What impressed me even more was how friendly and accommodating they were. Very helpful. They also paid a great attention to details. There was a fairly large space at the front of the car under the hood and they took extra time and effort to make sure that something was not missing (which there wasn’t). The icing on the cake was when I went in to pay I asked about how to get acrylic paint off of my car seat (I sat in some and it came off on the cloth seat). While I was paying he had his detailer work on the paint and got 98% of it out – for free. Okay, the candle on top – because my wife cannot drive, they delivered the car to our home. While I hope I never have to go back, if I need to have body work done I am going there. Highly recommend the business. Superb service and work. Needed spotlights removed from the roof of my E350, holes plugged (welded), roof distortion fixed, and repainted. I Chose Tom’s for 2 reasons. First, the E350 roof is hard to work on because it’s about 7 feet high, but they had no concerns about being able to do the work. Second, they produced a quote right then and there: Organizational efficiency and effectiveness, in my experience, is a dependable indicator of overall efficiency and effectiveness. Those are the reasons I gave them the work. If I had any new work, I would just go straight back to Tom’s, because they got it done on the date promised, for the quoted amount, and because the work simply was perfect. I’ll add that while their price was a little below the highest quote, I would bring them new work without shopping price, they are that good and trustworthy. I have taken my car to Tom’s twice in the last 7 months. They are very professional. They keep you informed about the progress of the repair and are all very friendly. Both times they fixed my car in a very timely fashion and had it looking like I just drove it off the showroom. You can tell they take pride in the work they do. I hope I don’t have to see these guys again soon but if I do, I would be more than happy to take my car back to them! I would recommend them to anyone! Thanks Tom, Art, Ron and your staff. Tom’s Auto Shop did a wonderful job. I can’t say anything but nice things about them. Their customer service was off the hook and it was a pleasure working with them to get my damages fixed. I would highly recommomend them to anyone looking for a good auto repair shop. Keep up the good work! Great service. All work was perfect and done fast. They are very detail oriented and do the work like they’re working on their own cars. Kudos to Tom’s staff and crew. My vehicle was repaired within 3 days and looks as good as new. These guys are the real deal. They stake their business on their reputation. I’d trust them to manage my bank accounts or teach my children to read…Or to repair my car. I want to first thank Garage Fly.. and all the people who took the time to write a review.. because that is how I choose Tom’s Auto Body. They were GREAT on all levels, I would never hesitate to recommend to ANYONE! Thank you Tom’s… they are very humble people too! Tom, Ron and Art at Tom’s Auto Body are the BEST! I’ve known them for over 24 years, (they’ve seen my kids grow up.) Any time we have ever need auto body work we’ve only used Tom’s Auto Body. Any time someone asks me for a referral for their auto, I send them here. They’re friendly knowledgeable, experienced and trustworthy. Why would I go anywhere else? Art and his guys are great. They do great work,on time and drop you off and pick you up from the airport. It’s a very succesful package for me. I hope I don’t have to use them again in the near future however. Twice in 3 months is enough. Great job guys. Excellent work and service, as always. They make a difficult time easy with all of their knowledge and experience. They even steam-cleaned my floor mats. Great job! Excellent repair work and excellent personnel. We use Tom’s for alot of our vehicle repairs and they always do an excellent job. Excellent workmanship! This is our second vehicle that has been repaired by Tom and his group and we feel the overall job and preformance was over the top! Tom and his guys are always professional, the shop is clean and the vehicles are always ready when promised. Tom and his group deserve the highest rating possible! Tom and his guys are the only auto body shop we use! They did great work and their service is excellent. They followed up on their work to make sure I was 100% satisfied. Thank you Art! This is the BEST auto body shop in Arizona! The customer service was great, they were friendly and kept us up to date on what was being done, and the work was beautiful!!! Thanks to all of you who worked on our car. You guys ROCK! Best auto body shop in Arizona. Excellent work on a timely basis at a fair price. What can I say about this shop..well we own 3 cars and wouldn’t trust anybody else but Tom’s Auto Body with our cars. Always very professional service from the father Tom Sr. to his two sons Art and Ron. Have been doing business with this shop for about 15 plus years. And when ask by someone if i know of a body shop the one and only name is TOM’S AUTO BODY. There must me a reason they have been in business for so long. They are truely out there for the customer 100%. Keep up the good work. I would highly recommend this place to anyone. I am a female who doesn’t know a lot about cars, and I felt that they treated me very fairly and respectfully. Although there were closer places to me, it was worth the drive. Thank you! Excellent service and work, excellent communication from Art and Ron. I have taken my cars to Tom’s for years and I am always so pleased with the service. I was sideswiped and had damage to my passenger doors. The people at Toms were friendly and terrific to work with, and the shop and office were clean and pleasant. When I picked up my car, it looked much better than it had before my accident. They even, unexpectedly, washed my car! I would recommend them. Excellent service and experience at Tom’s. Ron took the time to explain and show me exactly what had to be done to repair the damage. Tom’s competitive rates made it an easy decision to use their services. The car now looks great. Much appreciated. I have had body work done on vehicles in the past and it is always a huge hassle so that is what I expected when I took my SUV to Tom’s. Instead, they were courteous, reliable and delivered my vehicle on time. I wouldn’t take my vehicle anywhere else. This is a wonderful shop. I took my truck there for repair due to a rear-end collision. The staff is very friendly, and made me feel comfortable. They are very knowledgeable. They fully explained the work that was to be done, and answered all questions that I had. My truck was done and ready to be picked up a day earlier than promised. Alex from Tom’s Auto Body was extremely friendly upon my arrival. They assessed my window problem on the spot, told me they’d have the part by the next morning. I came back the next day and my repair was done under 30mminutes, albeit was for a minor window switch replacement. I was told by another garage, not registered with garagefly.com, that the problem was the more expensive regulator. Thanks to the staff at Tom’s I was able to get the correct problem fixed in an expedient manner. The best auto body shop in Arizona. The service and the staff were excellent! I had a great experience at Tom’s Auto Body. Customer Service was fantastic and the car was ready when they said it would. Art was great! He kept me informed of what was hapenning with my car (I was out of town when the car was getting fixed) and made sure the process was smooth and painless for me. They even washed my car for me! That was a nice surprise! I would highly recommend them. Thank for your searching for auto body service in Phoenix, AZ, and Tucson, AZ, areas. We are pleased you've chosen GarageFly to help you with your automotive repair needs. Tom’s Auto Body, Inc. is one of GarageFly's many user rated and reviewed auto repair shops in the Phoenix, AZ, and Tucson, AZ, areas. There are so many choices for automobile repair in Arizona; we feel it's important for you to be well informed. Please visit http://www.tomsautobodyphoenix.com/ for more information about this automobile repair shop's services.